In the opening editorial of Duhaime on Trusts, it was said that "some Canadian trust law professors insist on sustaining, within the auditoriums of Canadian law schools, unnecessary legal distinctions in this area of the law; distinctions that Canadian Courts reject every chance they get. So in some areas, the text books say one thing and the Courts say another." Nowhere is this more true then in the area of trusts that do not result from the clear statement of trust by a settlor but, rather, from either an intention that is presumed by the courts or a trust that is imposed by the courts when a certain set of facts occur. These two latter types of trusts are sometime classified as implied trusts (but even that word has been the subject of long, boring academic semantic debates). The first kind, those where the court will presume a trust, can be called resulting trusts. A constructive trust has nothing to do with intention, presumed or otherwise, but results in a court imposing a trust upon a certain situation of facts. The great English jurist and judge Lord Denning once said that any distinction academics try to make of resulting trusts and constructive trusts "is more a matter of words than anything else. The two run together" (Husse v. Palmer,  1 WLR 1286). If it quacks like a trust and walks like a trust, it must be a resulting trust. Resulting trusts are legal presumptions where an intent to create a trust is presumed by the person who buys property in the name of another. The property is deemed to be held in trust for the purchaser. So, the essence of a resulting trust is the presumption made by the law that the holder of legal title does not hold the property personally but as a trustee. Generally, those situations can be grouped into situations where a trusts results from a purchase, and those situations where a trust results from the failure of an express trust. When a person purchases property in the name of another, there is a presumption of a resulting trust; that the new owner is deemed to be holding the property on trust for the purchaser. This presumption applies to personal property as well as to real estate. Because it is a presumption, it can be rebutted easily enough (for example, if the money was a gift or a loan). Also, the presumption only applies if the person holding legal title on the basis of a resulting trust is a stranger or not a relative, to the purchaser. If there is a close family relationship between the person giving the funds Glenda and the receiving party, the law inverts the presumption and imposes what it calls a presumption of advancement. The presumption of advancement applies when a father or mother transfers property to their child, or to a child for whom they stand in the community as a parent (eg. step-parent). Matrimonial property rules in many jurisdictions have significantly diluted the presumption of advancement (see Canadian Matrimonial Property Law - A Primer for a discussion of this). A good example of a resulting trust is MacLeod v. MacLeod, a 1983 Nova Scotia Supreme Court decision. Mr. MacLeod feared bankruptcy so he sold his house to his brother with a secret agreement that the MacLeods could continue to live there and, as soon as possible, relieve his brother of the mortgage liability. The agreement did not specifically address the issue of title. There were some problems between the brothers such as some NSF cheques. MacLeod finally asked the court to order the return of the property. The court ordered the return of the property saying that the deal between the brothers was a resulting trust as "analogous to the case in which the purchase price is advanced by one party and title placed in the name of another." Oddly, the law is unclear as to whether or not a resulting trust is created if a person, instead of buying real property, transfers property he or she owns to another. It would seem that there is a presumption of a resulting trust in these circumstances but it is a weak one indeed. In Neazor v. Hoyle (1962) 32 Dominion Law Reports 131, the Alberta Supreme Court decided that there was a resulting trust in cases of "voluntary transfer" but that all the circumstances may be looked at to rebut the presumption. The situation is different with voluntary transfers of personal property. In Standing v. Bowring (1885) 31 Ch. D. 282, the English court noted that when a person transfers money to a joint account, there is a prime facie presumption of resulting trust. If an express trust fails, then the trustee can be said to hold the property in a resulting trust for the settlor, to whom the property reverts. Several examples of how a trust could fail were reviewed in earlier pages Duhaime on Trusts and include unlawful purposes, vague objects, undue influence, fundamental mistake or, in the case of a testamentary trust, failure to comply with compulsory provincial formats for wills. In Re Gillingham Bus Disaster Fund (1958) Ch. 300, the mayor of an English town issued an appeal to establish a fund for the victims of a terrible bus crash. The money was collected but when it was discovered that the insurance company would cover all damages, the mayors asked the courts what to do with the surplus. The courts decided that the moneys should go back to those persons who had given it, as difficult as that was going to be. Constructive trusts are the second kind of implied trusts; trusts which come about by the effect of the law, instead of by express declaration of a settlor (the latter being called express trust). Constructive trusts seem to be a hot judicial commodity, in recent years, it's use more and more common in Canadian courts. To hear the legal expert's recipe, you would be told that a constructive trust is one of several equity-based remedies which relate to property. In other words, the constructive trust, like other trusts, is an equity-based legal tool. It is related to specific property so lawyers call it a "proprietary" remedy. The importance of this legal nicety is that the remedy can be effective even if the property has passed into other hands (see notes about tracing against a bone fide purchaser in Trusts: When Things Get Nasty). It also means that to ask a court for a constructive trust finding, there must be some property to which the trust can attach itself or the court must be asked to create some new property right. Constructive trusts are also said to be "remedial" in that they are not property tools (as express trusts are) but are creations of the courts, relying on their jurisdiction under equity, to correct some unequitable wrong - some unfairness; thus, "remedial." 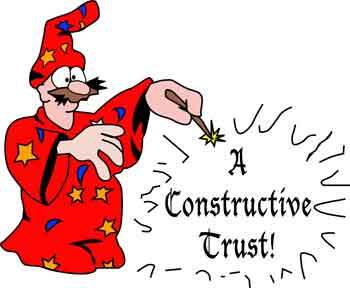 Constructive trusts are often described as corrective or even punitive. There can be said to be four headings under which constructive trusts can be found and this is not a static list as the judicial love-affair with constructive trusts continues unabated. They are fiduciary gains, breach of confidence, strangers to the trust and constructive trusts to redress mistake or fraud and the remedial constructive trust. We said, earlier, in Trust Law: The Players that trustees are not to keep, personally, any revenues or gain derived from the trust property; they are prohibited from profiting from their trust. Any gains must be given over to the beneficiary. This principle holds true for all persons in a fiduciary position; not just trustees. In Drysdale v. Humphrey Estate (1992) NSR 344, the court held that there was an absolute prohibition against the trustee dealing in trust property for his own benefit, no matter how honest the circumstances. It has also been held that this principle will not be taken to an extreme. In Aas v. Benham (1891) 2 Ch. 244, an English court held that to"
"... hold that a partner can never derive any personal benefit from information which he obtained as a partner would be manifestly absurd." It should also be noted that the trust agreement may derogate from this general principle by allowing the trustee to retain, personally, in whole or in part, profit from the trust property. The remedy for this type of prohibited action by a fiduciary is the constructive trust, which opens the door to an allegation of breach of trust. Trustees are fiduciaries; of this, there is no doubt. But it is not uncommon for persons to try to establish in court that another was a fiduciary and thereby get the court to invoke a constructive trust against that person, so as to benefit from the saddle of fiduciary duties that is suddenly thrown upon the back of the newfound fiduciary. The courts are wary of this type of manoeuvre and have said that a fiduciary relationship only exists if (1) the fiduciary has scope for the exercise of some power; (2) if the fiduciary has independence of action so as to affect the beneficiary's legal rights; and (3) if the beneficiary is particularly vulnerable or at the mercy of the fidciary (Frame v. Smith (1987) 2 Supreme Court Reports 99). Typical fiduciaries include trustees, guardians, corporate directors, partners to each other and the agent to the principal. The misuse (for personal gain) of confidential information by a company director (the property being the confidential information) could lead to a court action for constructive trust. By the same token, fiduciaries who redirect opportunities from their beneficiary to themselves, can be found to be holding them under a constructive trust. In Canadian Aero Services Ltd. v. O'Malley (1974) Supreme Court Reports 592), Canada's highest court said that the duty of a fiduciary comes with a "strict ethic" which may even preclude a director from using confidential information after resignation. It seems as well that each case will be judged on its own merits to see if a conflict of interest existed. The acceptance of secret bribes or commissions is a no-brainer for the courts: the fiduciary will be required to remit it to the beneficiary under all circumstances. In many jurisdictions, the criminal law is keen to catch errant or dishonest fiduciaries. For example, in Canada, the Criminal Code prohibits secret commissions (§336 and §426). In Lac Minerals Ltd. v. International Corona Resources Ltd., Canada's Supreme Court established that a breach of confidence occurs when (1) the information conveyed was confidential; (2) that is was communicated in confidence; and (3) that it was misused by the party to whom it was communicated. As we reviewed in Trust Law: When Things Get Nasty under Strangers to the Trust, persons meddling with a trust can be held to be constructive trustees. Where express trusts fail because of mistake or fraud, the vehicle of a constructive trust is often used to ensure the proper return of the trust property to the settlor. No discussion of constructive trusts in Canada is complete without reference to the 1980 and 1993 Supreme Court of Canada decisions in Pettkus v. Becker and Peter v. Beblow. Both these cases are fully summarized in Trust Law: The BIG Cases. the enrichment is "unjust" or without legal justification. Courts like to talk of an "absence of any juristic reason" to justify the enrichment of the defendant at the expense of the party claiming constructive trust. In Peter v. Beblow, the Supreme Court of Canada added that the connection between service rendered and the property must be direct and sufficient. In matrimonial property matters, use of the constructive trust is now quite rare because new legislation is almost all provinces allows the spouses to petition the court for a division which can take into consideration all factors and order a division based on fairness rather then the strict rule of law (for a discussion on this, see Matrimonial Property Law in Canada). It still is useful, however, in common-law relationships and has even been used to resolve a property dispute in failed homosexual relationships (Forrest v. Price (1992) 48 ETR 72). It should also be remembered that if no express trust can be found for any of the reasons enumerated in Duhaime on Trusts - An Introduction (i.e. absence of one of the three certainties or conveyance), it may still be possible to find a constructive trust. This is what happened in Brisebois v. Modern Music Co. (1993) 50 ETR 305. A father bought a house, through his company, for his daughter upon her marriage. His daughter and son-in-law did not pay the mortgage but they did pay for significant improvements. When the marriage went sour, the ex son-in-law claimed half of the house on the basis of an express trust. That part of the claim failed but the court did find a constructive trust. Or, if a resulting trust does not present itself to the facts, there might yet be grounds for a constructive trust. This was the case in LeBlanc Estate v. Allain (1993) New Brunswick Reports 81. Constructive trusts are not restricted to family law matters. They can and are useful in the commercial arena as well. This was affirmed in Hill Estate v. Chevron Standard Ltd. (1993) 83 Manitoba Reports 58. Another case, Porta-Flex Products v. Bank of Montreal (1993 108 Nfld. and P.E.I. Reports 221 suggests that the doctrine of a constructive trusts is difficult to apply in the commercial arena but that it was possible, and depended on the facts in each case.